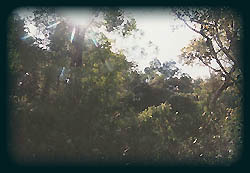 The hilly regions of Tasik Kenyir is a world of untouched virgin tropical jungle estimated to be millions of years old. There is no exact estimation of the number of species of plants and wildlife existing within this vast ecosystem. 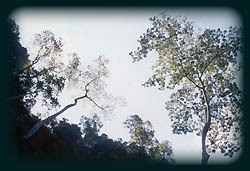 Dipterocarpus shrouds the horizon and towering trees of the majestic Keruing, Meranti and Kapor loom above while the exotic, wildlife roam freely below. For research scientists, nature lovers, adventures and keen photographers, there is no rival as Kenyir promises to be a world of discovery. 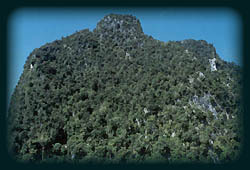 The highest elevation in Tasik Kenyir is Mount Cergau. Meanwhile Mount Gagau with an elevation of 4,514 feet above sea level is the second highest peak in Taman Negara after Mount Tahan. Expeditions to Mount Gagau have been proven to be an exhilarating experience. For the many who have scaled this mountain, it is truly an experience to cherish! Among the other peaks in Kenyir are the Bongsu, Tembat, Raung, Kachang, Cergau and Gajah Terom. At present, there are no facilities on the other peaks except for Mount Gagau where base camps and hiking trails have been set-up. KETENGAH (Central Terengganu Development Authority) recognizes that the mountainous tropical rain forest offer tremendous eco-tourism potential. In ensuring that this natural heritage is well preserved, proper steps are now being taken to provide facilities such as ranger stations, base camps and hiking trails and all activities and developments are closely scrutinized. Should you decide to venture into these hilly regions please consult the relevant authorities.